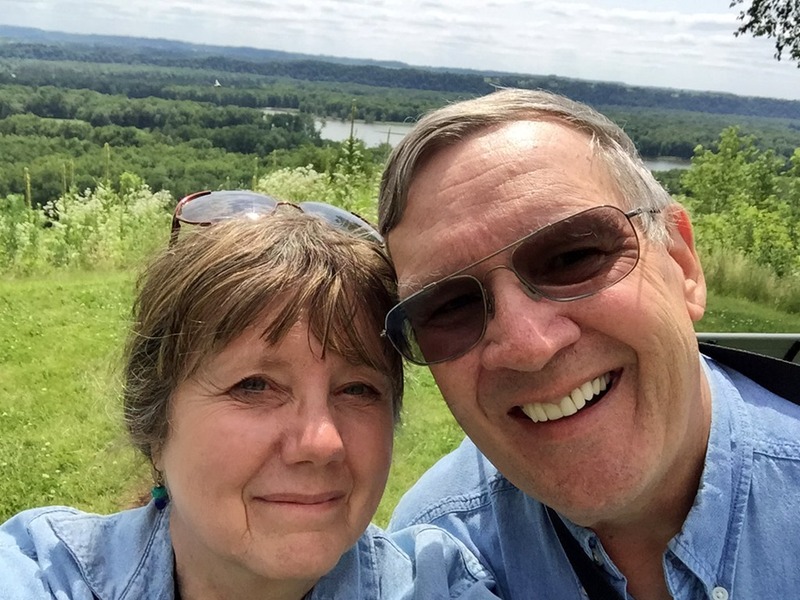 So the weather was perfect and my hubbie wanted to take me along on a road trip to see some Indian Mounds at Nelson Dewey State Park by the Mississippi River this past week. On the way he surprised me by making stops at several quilt shops along the way (what a sweetie!). 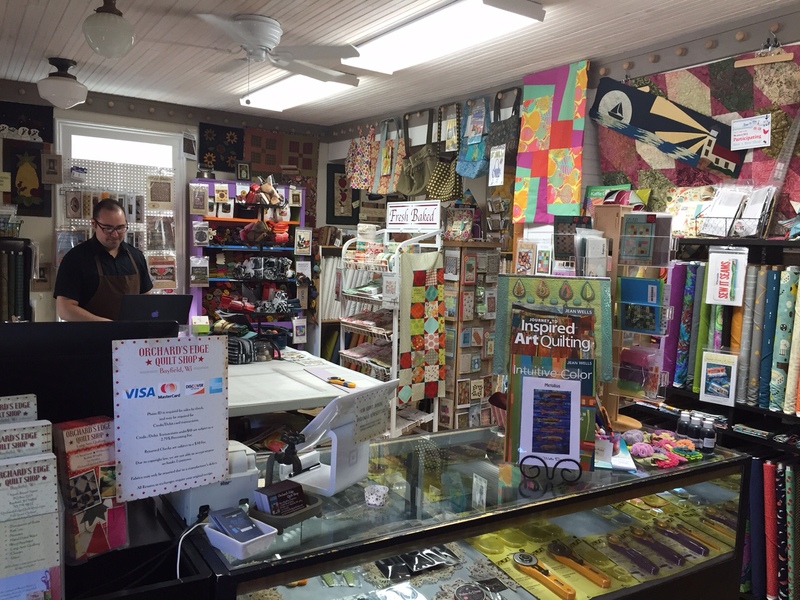 Our first stop was Petals & Patches in Belleville. 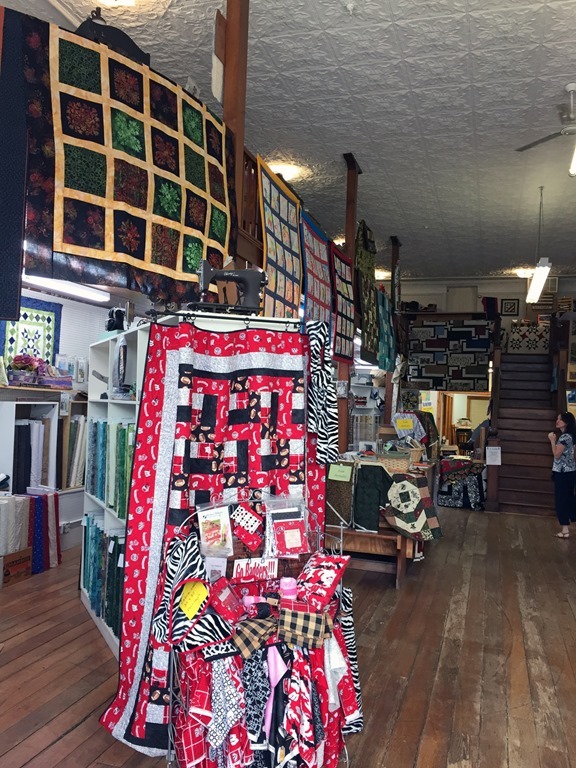 I just love the atmosphere in this quaint quilt shop in an older two-story building downtown. 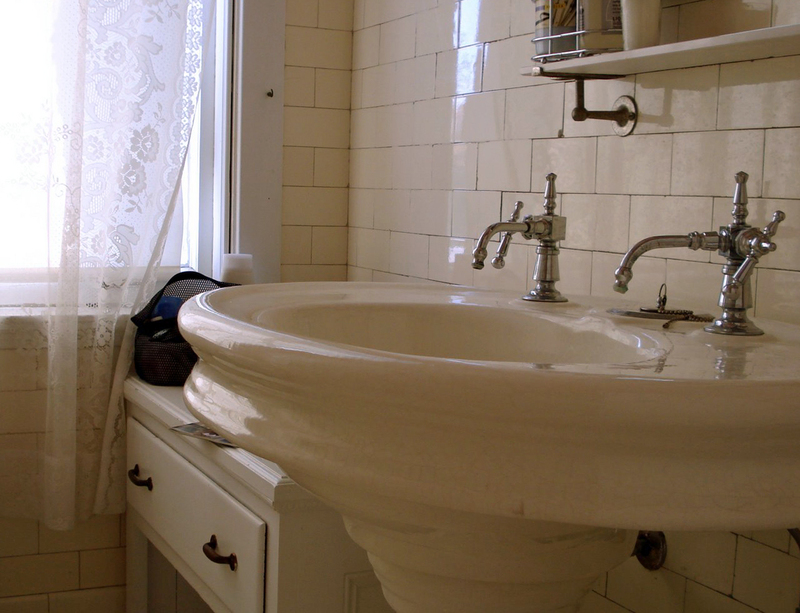 There are so many rooms to explore–upstairs and down. It took quite awhile to see everything. 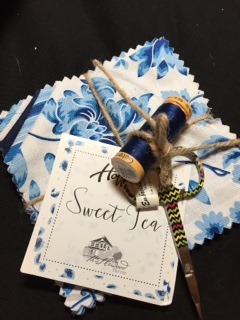 I found three lovely background fabrics (Hoffmann by McKenna Ryan) that will work as perfect backgrounds for my landscape art quilts. I also found a cute chickadee fabric in the Christmas area. Andi (the owner’s daughter) waited on me, and gave me permission to take her photo (see below). She was so helpful! Andi was so helpful and friendly. 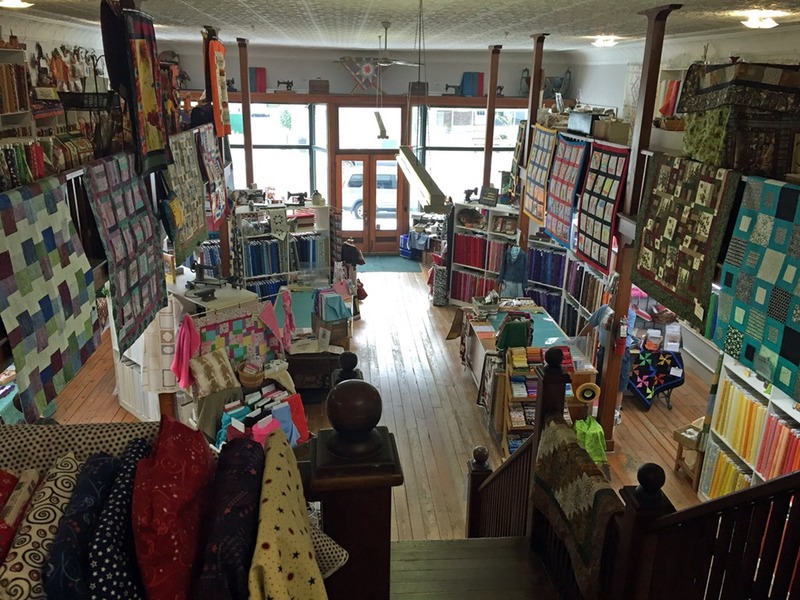 View overlooking the front of the store from upstairs. 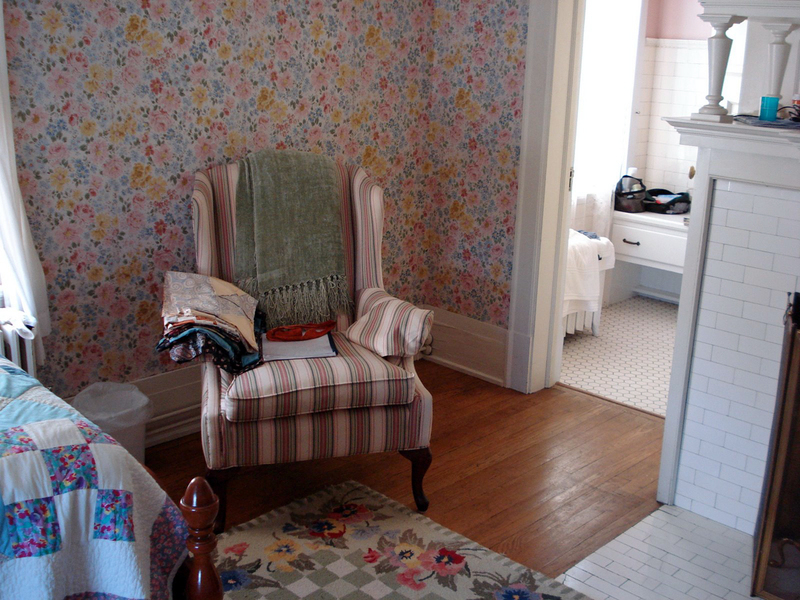 One of many rooms to explore–this one has baby fabric. 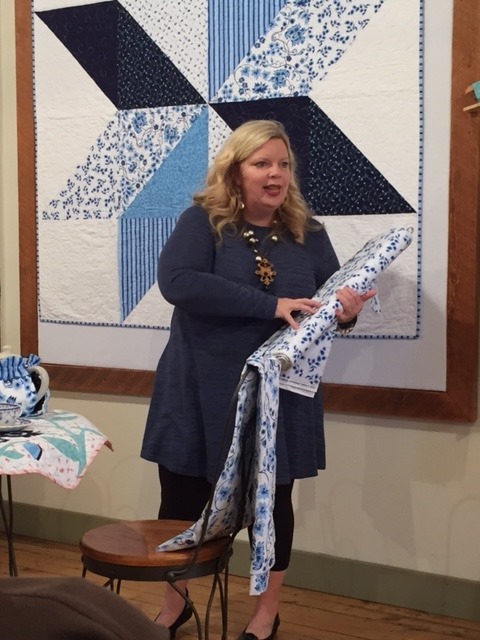 The next stop on the way was Quilter’s Compass in Monticello. 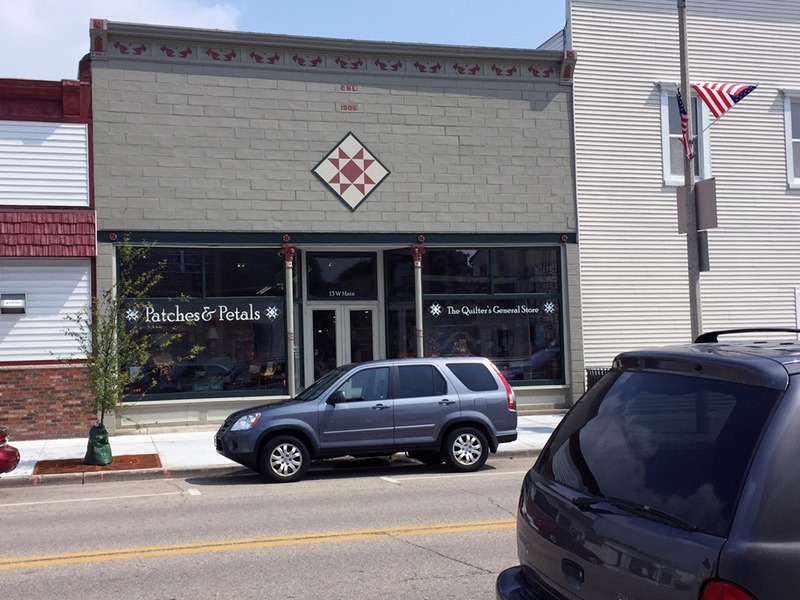 Their beautiful store is also in an older building on the corner downtown. 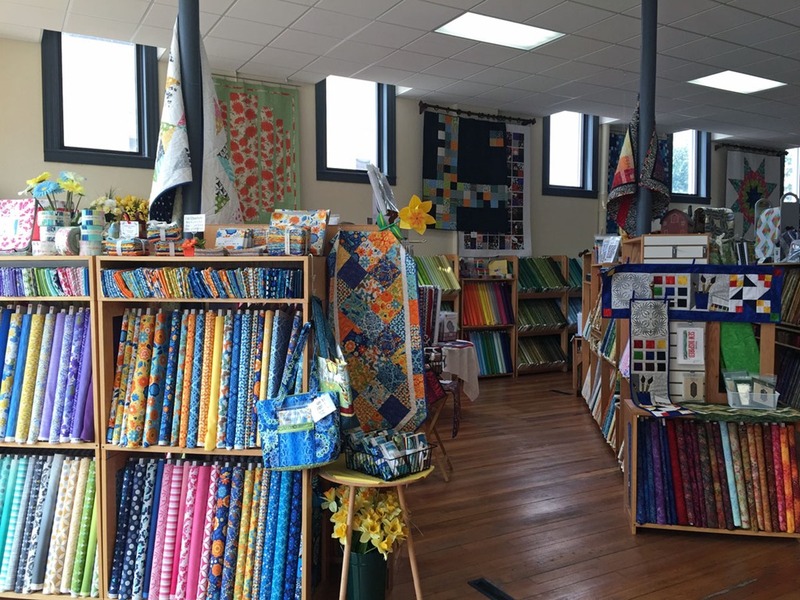 There’s lots of light coming in the large front and side windows to brighten up the huge room as you explore all the fabrics they carry. Everything is nicely organized. 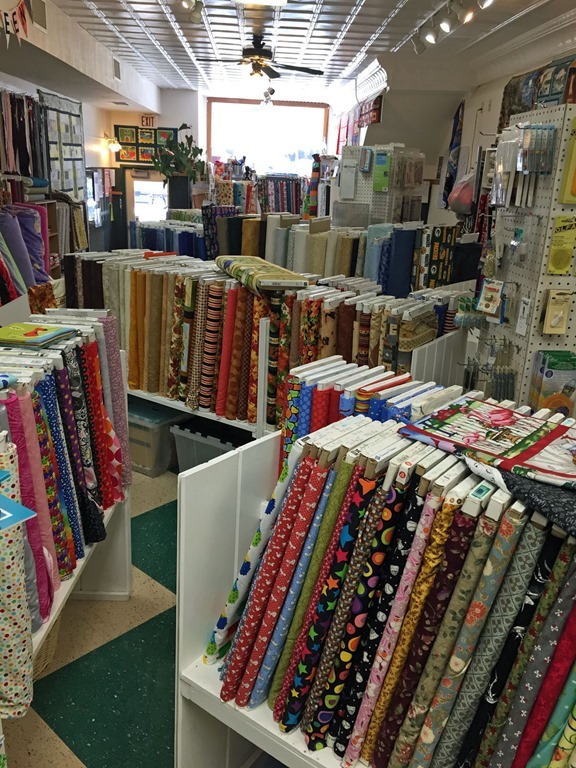 They carry a lot of wonderful Moda fabrics I love (including precuts). The salesperson didn’t want me to take her photo, but she did allow me to take several photos. I found a fat quarter (last one!) of a paisley Moda “Double Chocolat” that I needed to stretch my leftovers into projects. You never know what treasures you’ll find. to your right as you walk in … and there’s more in the back, as well as a huge classroom. 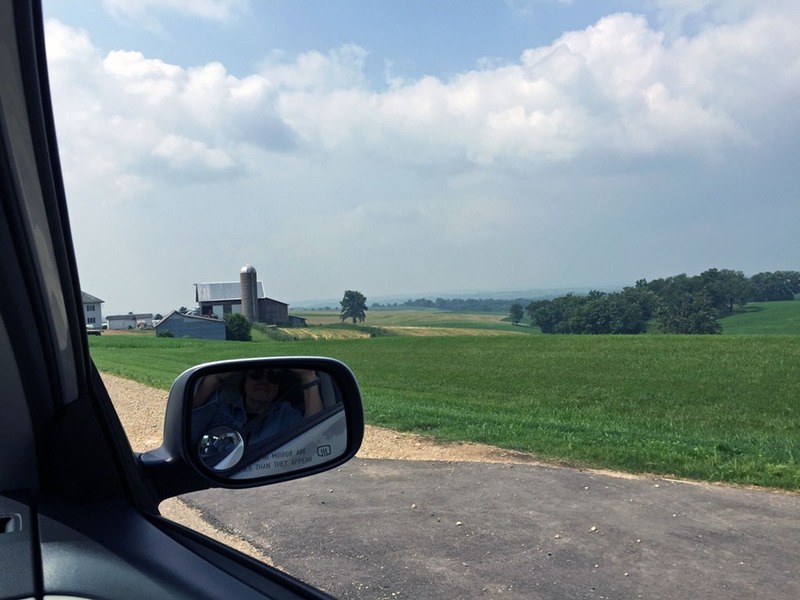 Beautiful countryside–you can see for miles. Bet it’s gorgeous in the autumn! 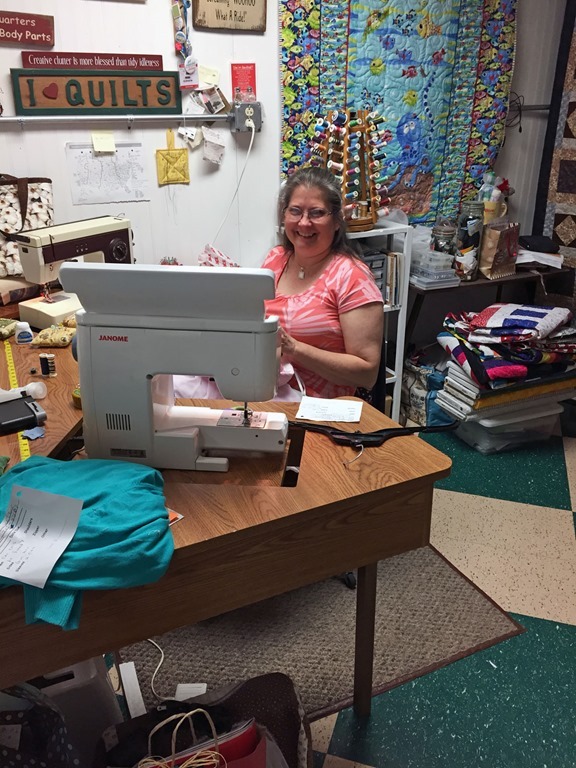 Heidi (owner) working in the back of the store; so cheerful & welcoming. 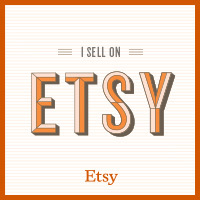 Relatively smaller, but jam packed with luscious fabrics! Someone we met along the way suggested we lunch at the Potosi Brew Pub, and since it’s not too far out of our way (and we were hungry), we decided to go. 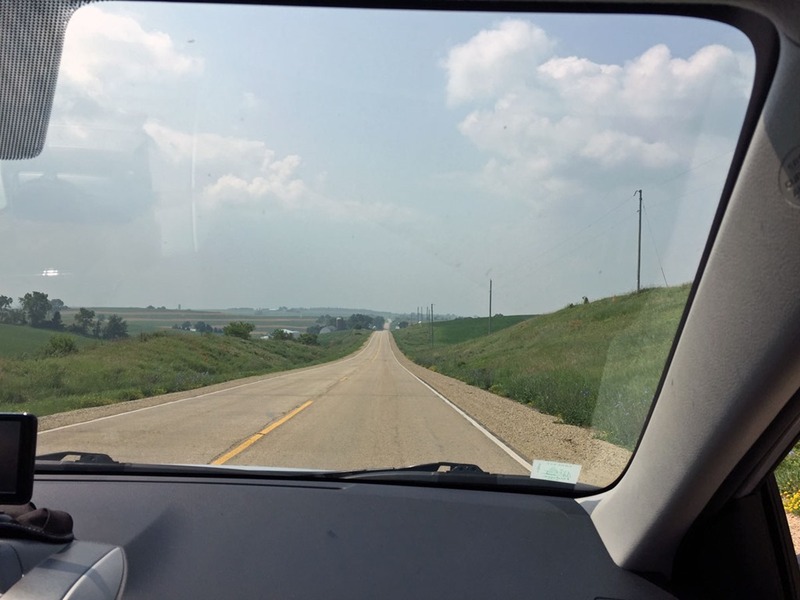 It was well worth the trip through the beautiful rolling Wisconsin countryside. 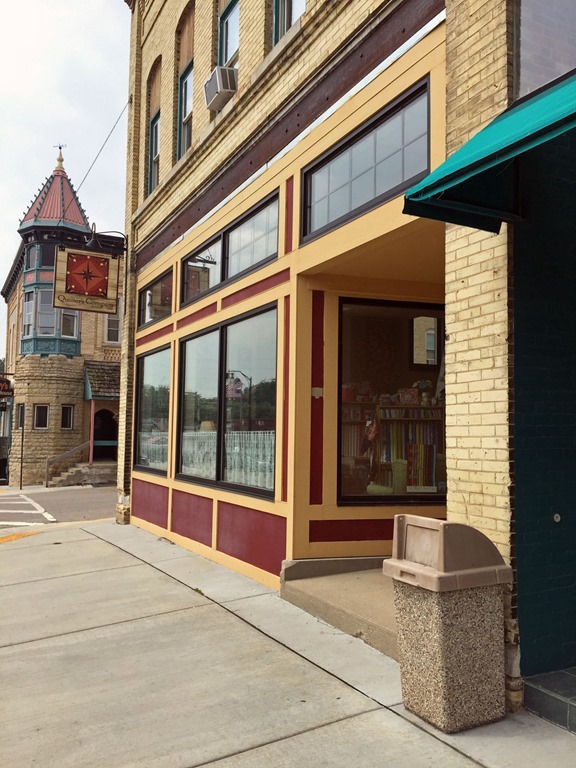 The Pub is in the historic Petosi Brewing Company Building, which has exposed brick, tall ceilings, and a beautiful wood carved bar. We didn’t take the time for the tour, but the food and service was excellent. We’ve got it in our Garmin so we will have to stop in again soon. 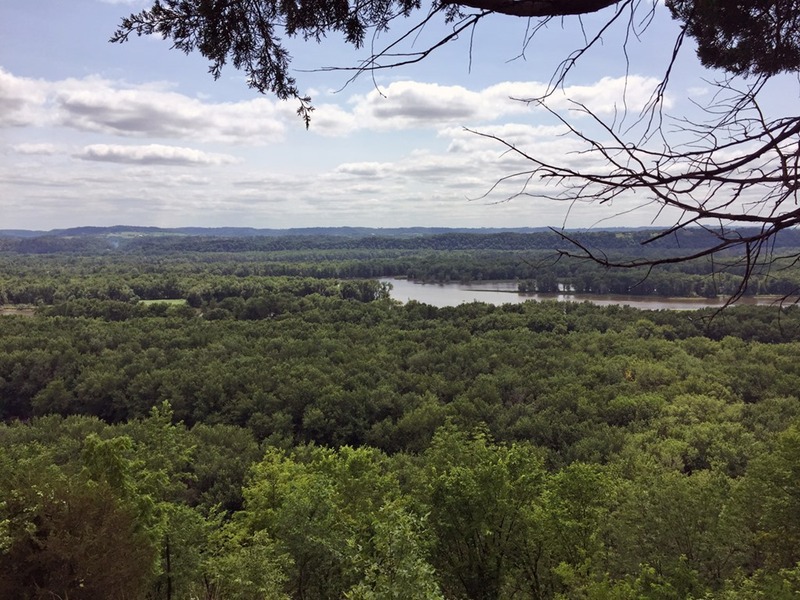 The Nelson Dewey State Park was awesome…breathtaking views of the Mississippi Valley from the bluff. The Indian Mounds were a bit disappointing, as they were difficult to make out in the brush and overgrowth, but Dave got some photos…while I snapped a few shots of the spectacular views. All in all, it was a great day. 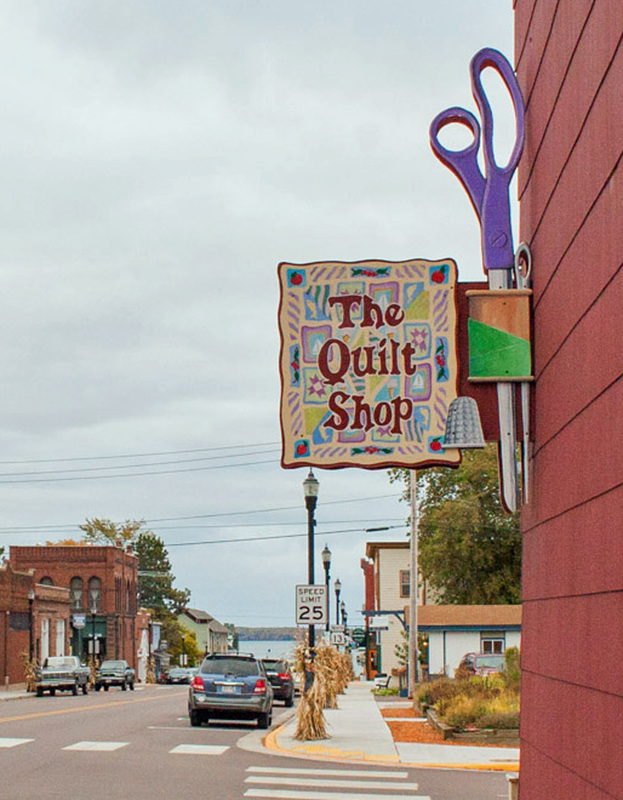 These are just a few of the wonderful quilt stores we have in Wisconsin. We didn’t have time to visit more on our way to the Mississippi, but there are several more in the area. 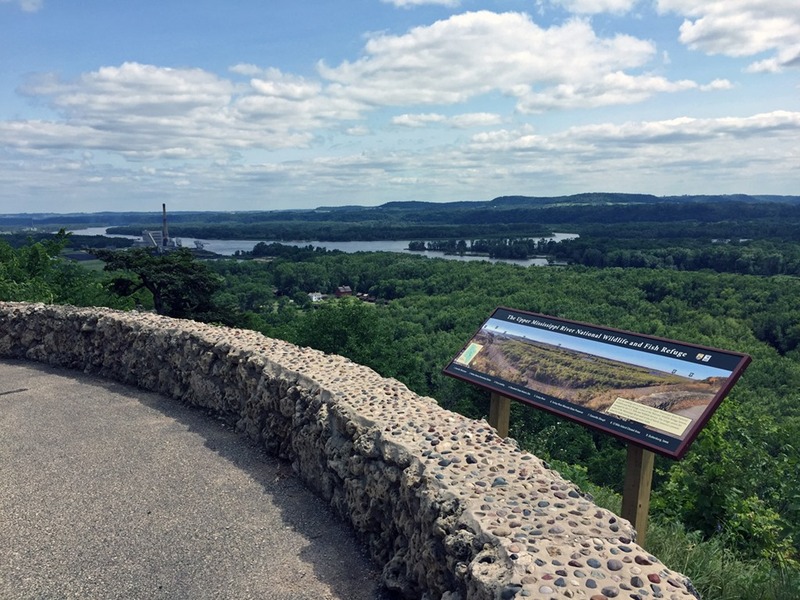 I hope if you’re a Wisconsinite, or a summer vacationer here from out of state, that you’ll stop by and explore more of them! 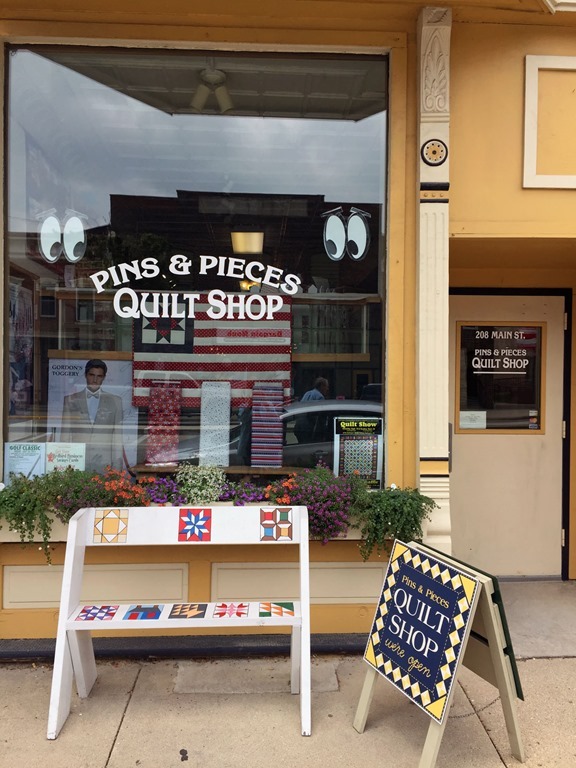 Bye for now… and HAPPY QUILTING! 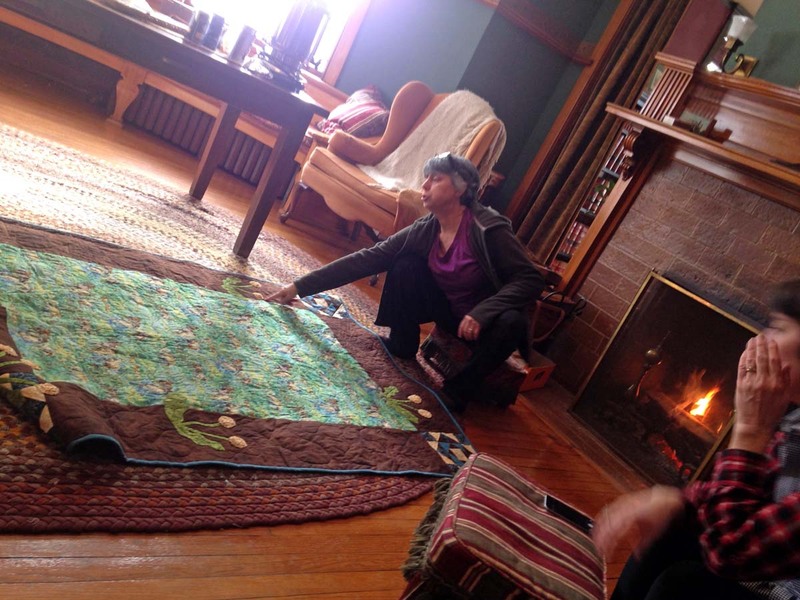 I just got back from a week-end quilting retreat at the Jones Mansion Retreat Center in beautiful Mineral Point, Wisconsin. The February weather was cooperative–no icy or snowy roads to contend with. Mineral Point is only an hour’s drive southwest of Madison, but I still hate to drive on icy roads. I’ve been coming to the Mansion for over ten years, and every time I step over that threshold I feel like I’m being transported in to a simpler, more peaceful time in history and instantly feel relaxed. 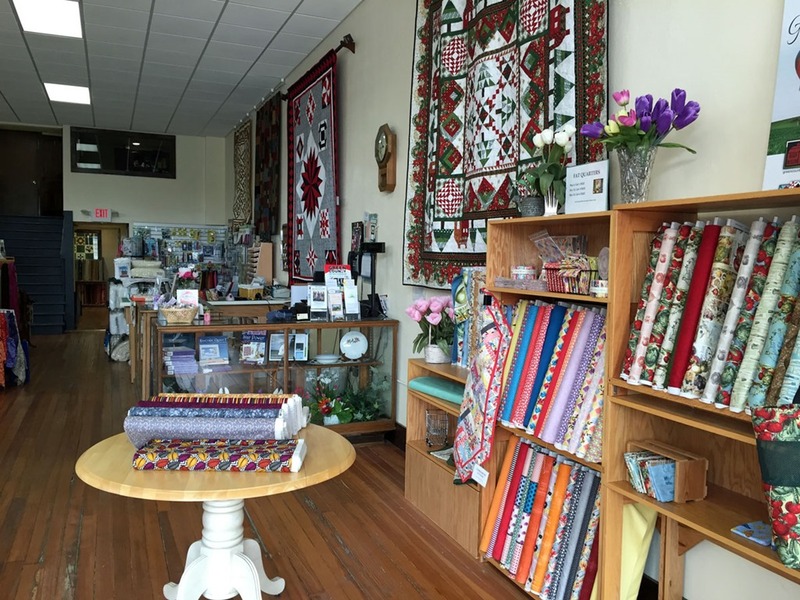 What a great place for a quilting retreat! 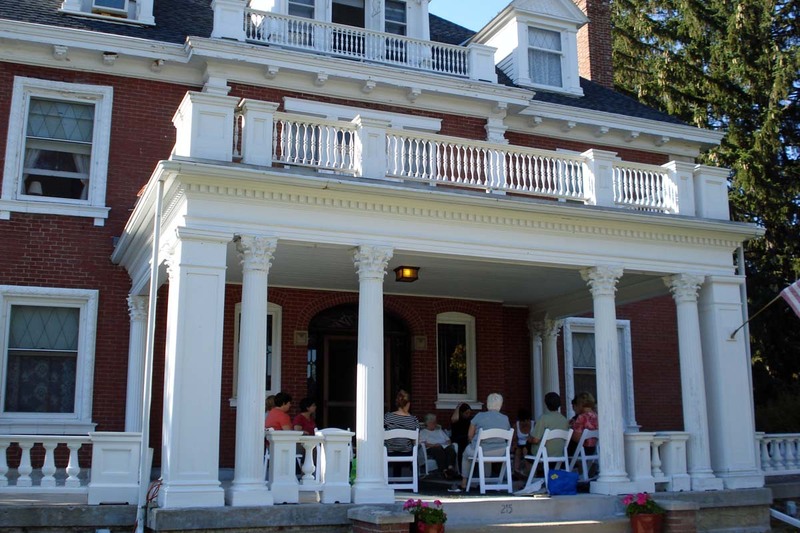 This retreat was organized by the owner, but there are other retreats to join in with–or you can create your own. 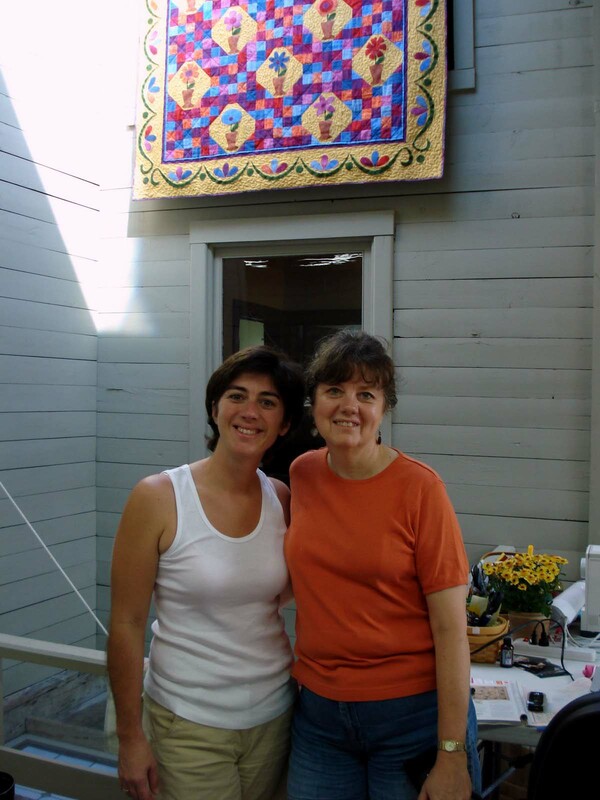 For this retreat, I came with a friend, and others joined us–some I knew, some I met for the first time. (Aren’t quilter’s the best people?) 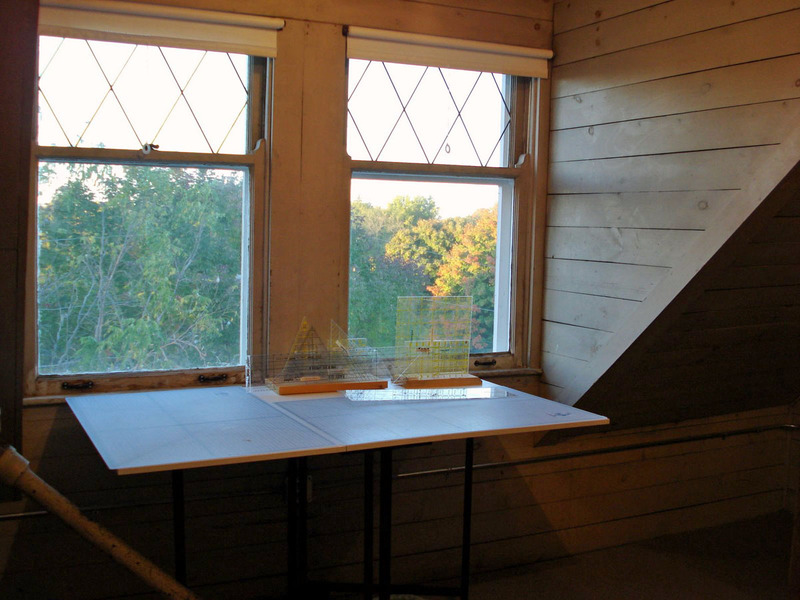 We all brought our own projects to work on, and because the third floor has been made into the perfect work space, we can easily share ideas, chat, and just enjoy the creativity going on in the room. 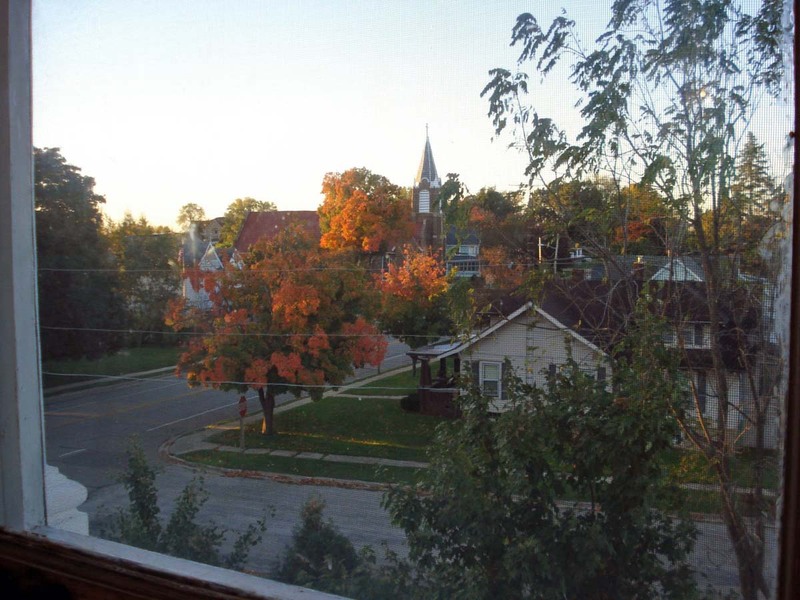 I’m an early riser (still PJs)–anxious to start a new project. 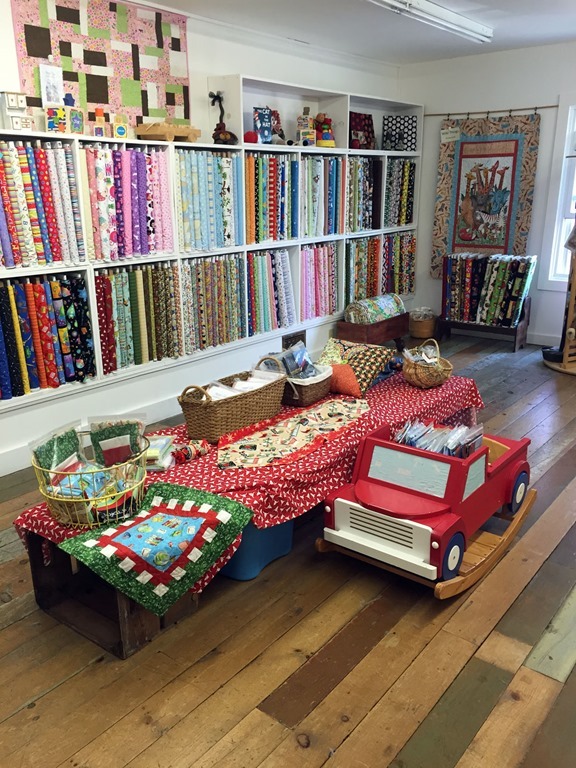 We’ve got the freedom to quilt whenever we feel like it–early in the morning, or late into the night. There’s several tables in the room with extension cords, Ott lighting, and the dormers each have large ironing stations and cutting tables with mats (which means less to pack!) 🙂 It’s fun to see what everyone’s working on. 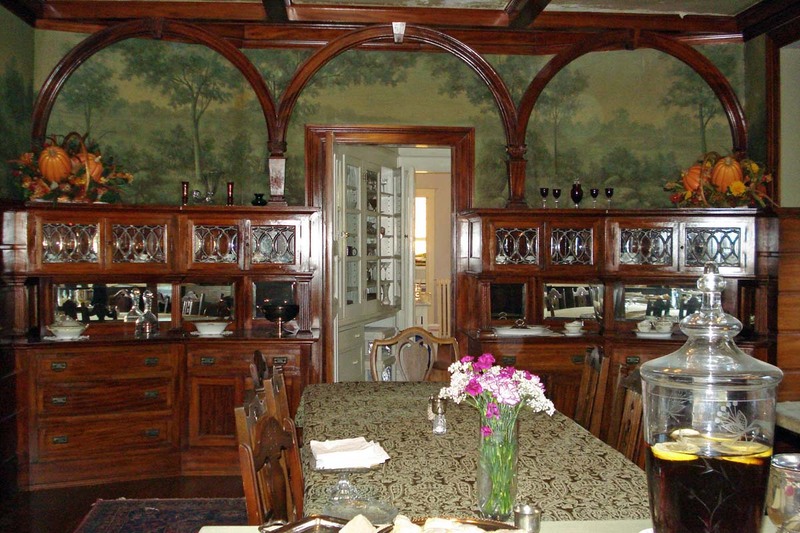 I was in my favorite room this time–“the Master”, although I’ve stayed in almost all the rooms at the Mansion and love each one. 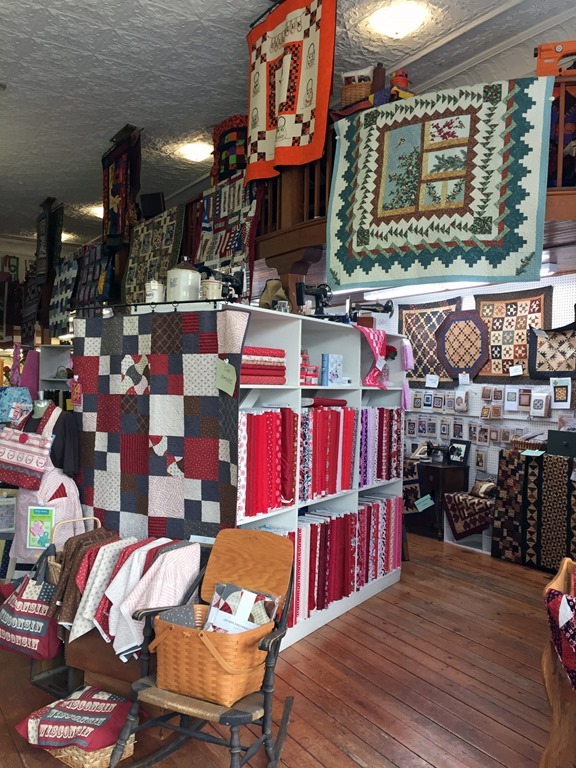 Every bed has a hand made quilt…some share bathrooms, some have adjoining bathrooms, most have 2 twin beds, one has 3, and a few are single rooms…but all are very comfortable and welcoming. 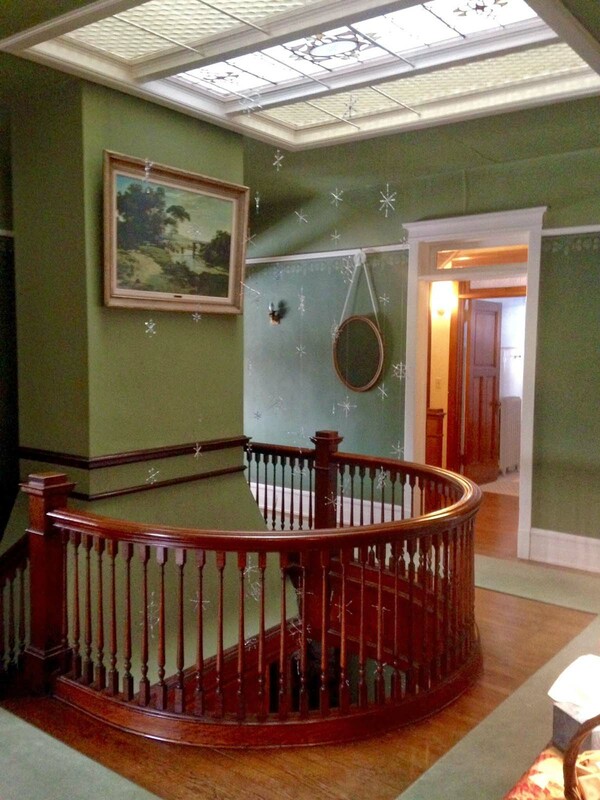 I don’t have photos of all the bedrooms, but here’s a few… the Mansion will hold up 12 very happy campers. 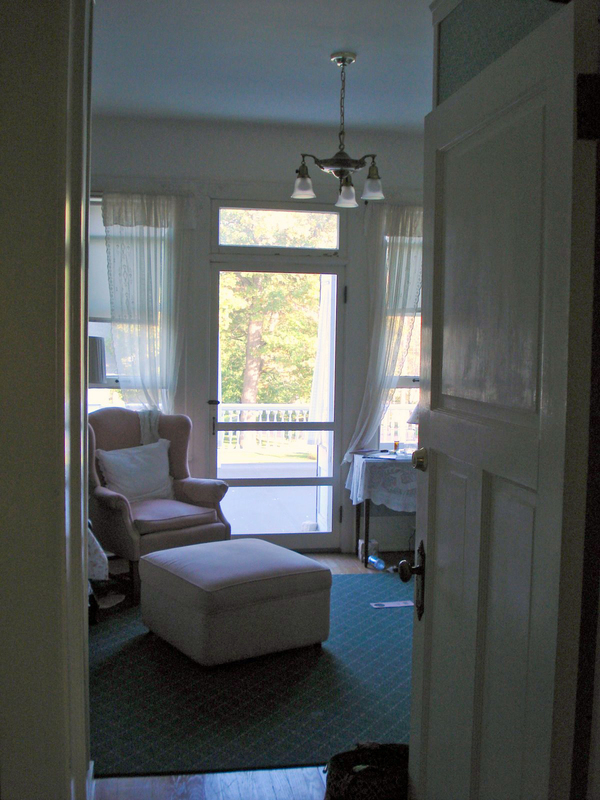 This room looks out onto a porch. 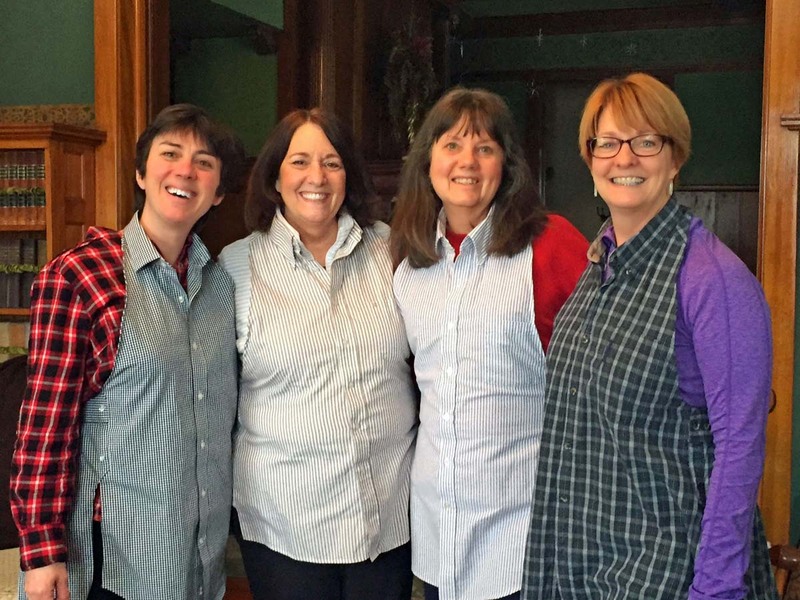 Each of us shared the cooking responsibility–we had Saturday night (soup and salad)…simple. We all eat in the downstairs dining room. 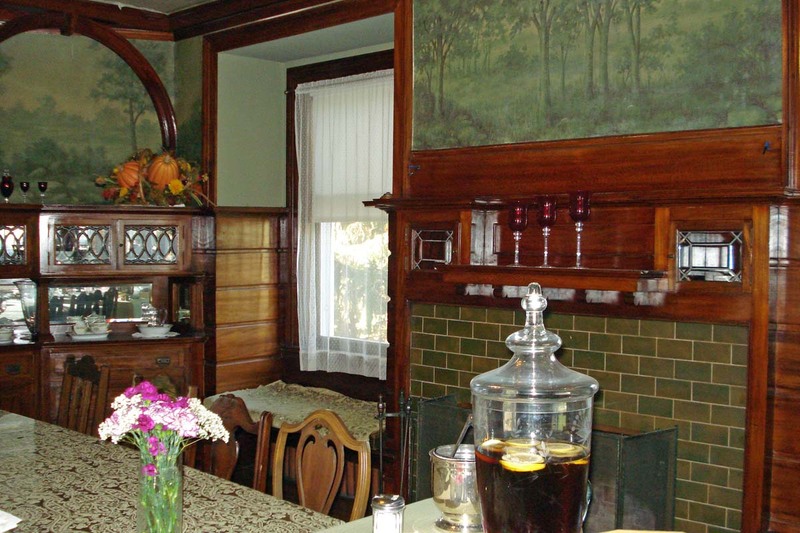 Such beautiful woodwork and hand-painted wallpaper (original). 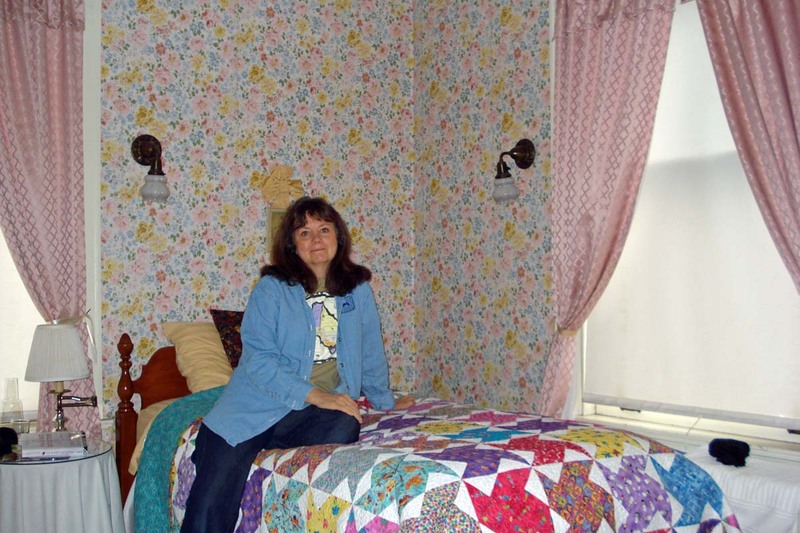 Lori (the owner) can tell you all about the history of the house and how she so lovingly restored it back to its former glory. 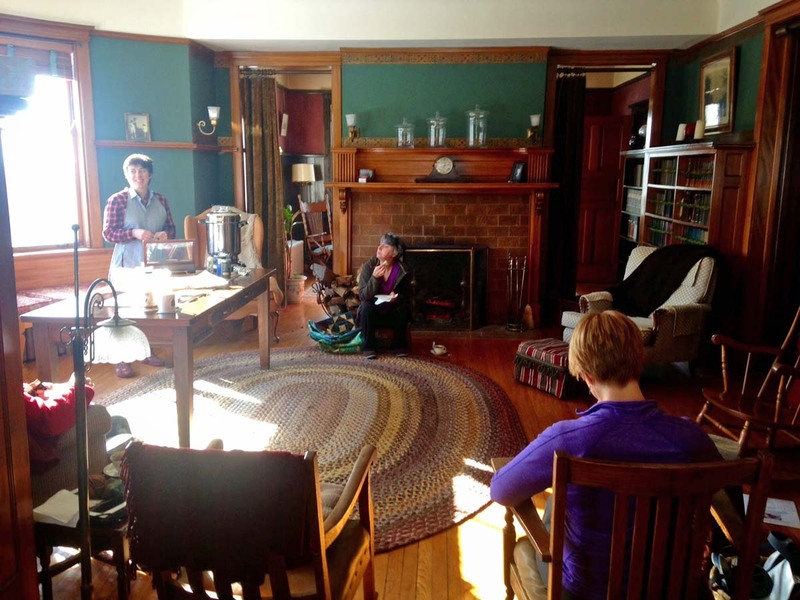 Sometimes we relax with tea and snacks in the sitting room. And at night (one of the perks of being there in the wintertime), Lori can start a wood fire in the fireplace. 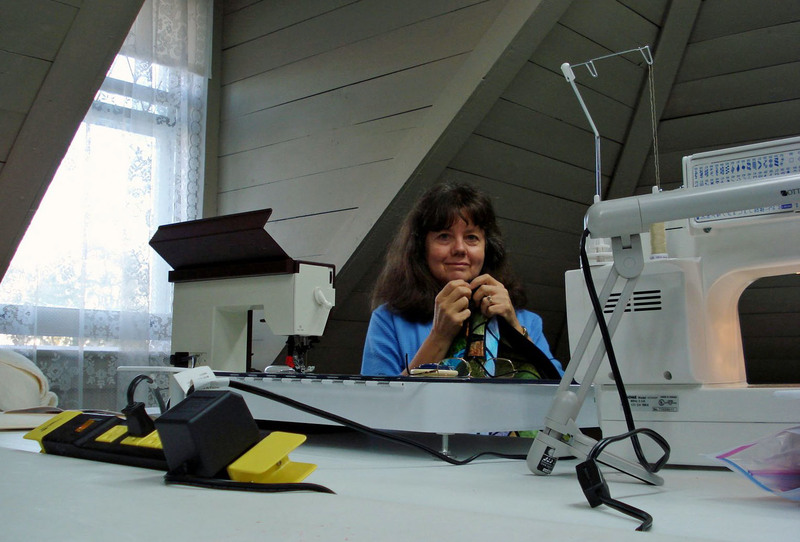 We bring our knitting and handwork and enjoy it. 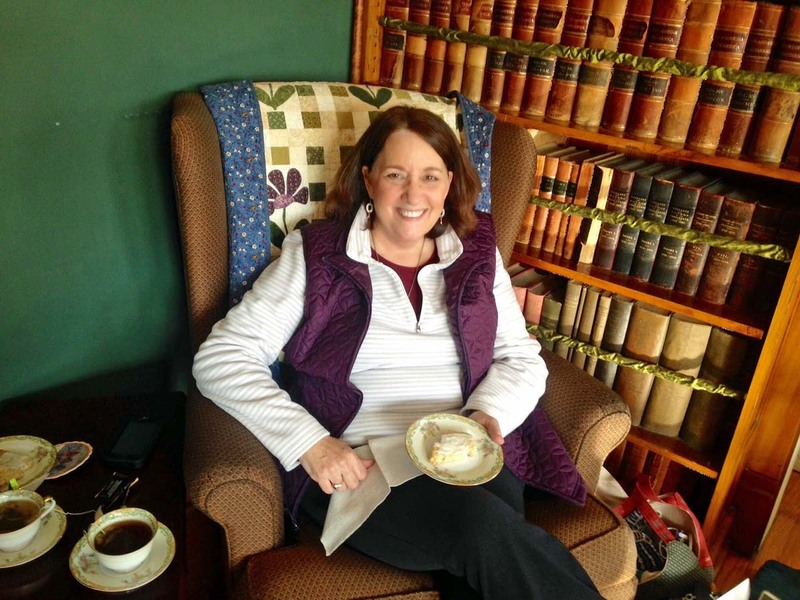 Friend (Jean) enjoying tea & treats. Sitting room with fireplace & large window seat. 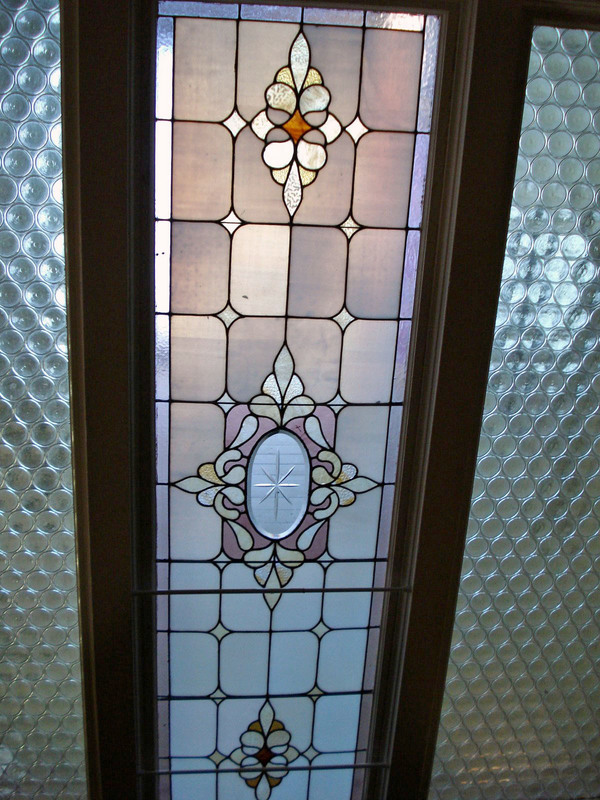 And if you look up, you’ll see the beautiful stained glass skylight that floods the second floor with light. Each of the bedrooms have large transoms that filter light into each room. Wasn’t the builder forward thinking for 1906! Close-up–this would make a great quilt! 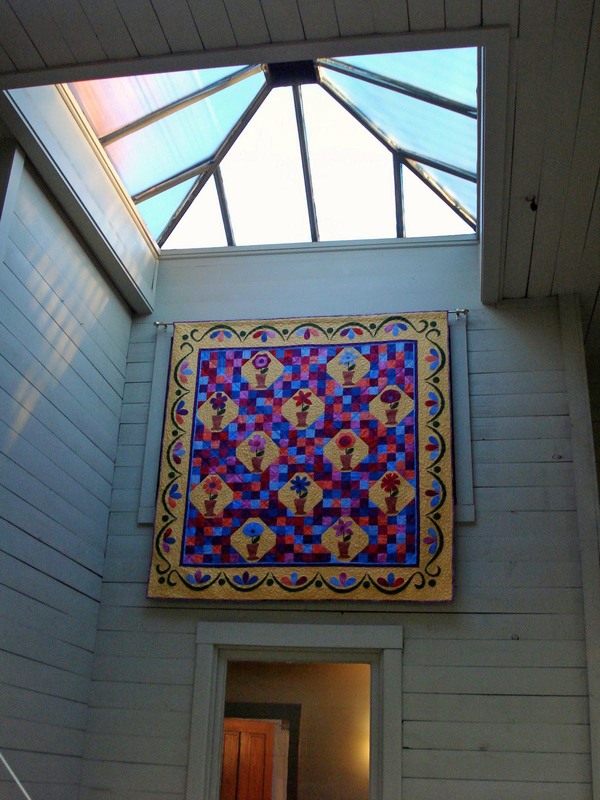 Here’s what it looks like from the third floor…or course there’s a quilt on the wall! 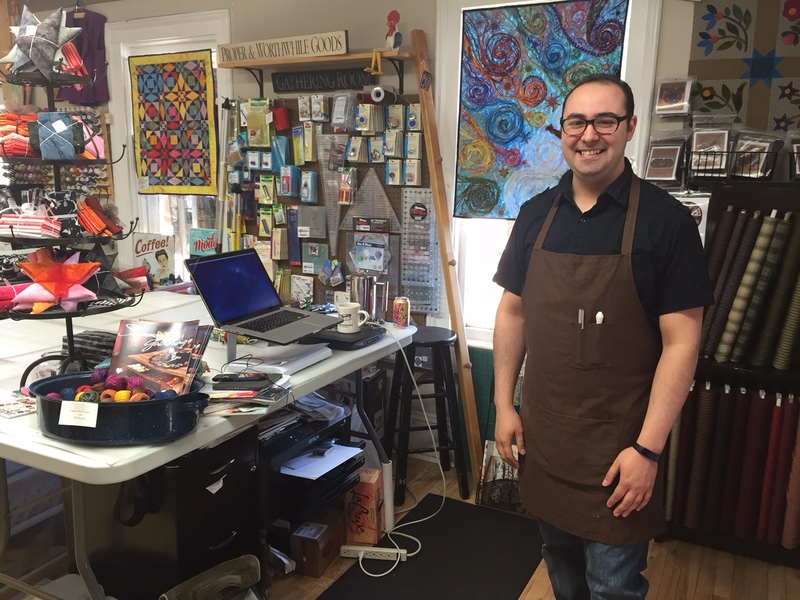 …and a photo-op with the lovely owner & hostess, Lori Bartol. Wish I had taken more photos–once I’m there, I’m so wrapped up in talking with people, sewing, and eating I forget to take any. Lori has wi-fi at the Mansion, but I hardly checked my email. In February it was so cold outside, but so cozy warm inside the Mansion that we didn’t want to leave, so we didn’t go downtown for a shopping spree this time–but downtown Mineral Point has a lot to offer in the way of unique shops and restaurants. 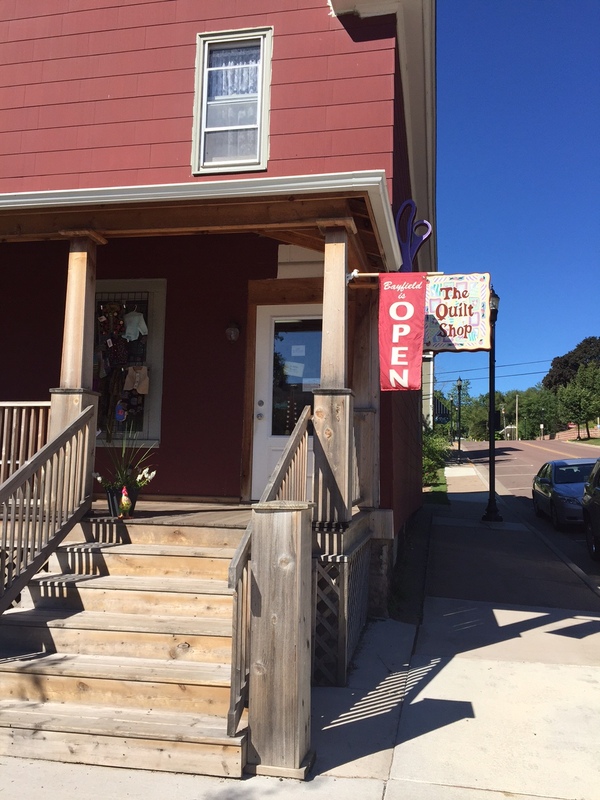 However, we did manage a quick side trip to the quilt store in Platteville called Hidden Quilts. It’s not as “hidden” since they moved to a larger location on Main Street, and it’s always fun to go there. I didn’t do too much “damage”–but couldn’t get away without buying something. Be sure to stop if you’re in the area. 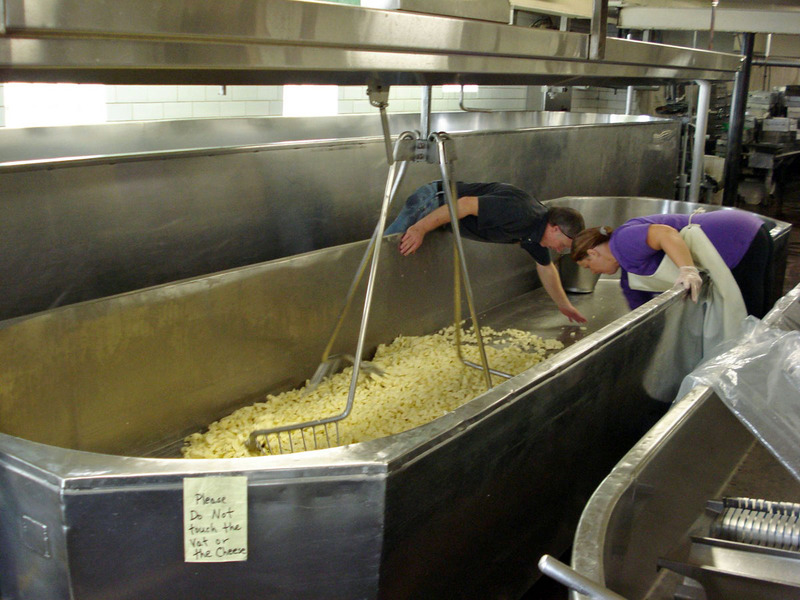 We also missed going to Hook’s Cheese, but if you ever go to the Mansion on a retreat, you HAVE to stop downtown Mineral Point at Hook’s Cheese on the day they make the fresh cheese curds! …wow! They also have award-winning Blue Cheese. Making the fresh, squeaky, cheese curds at Hooks. YUM! I’m coming home refreshed with all kinds of new ideas. 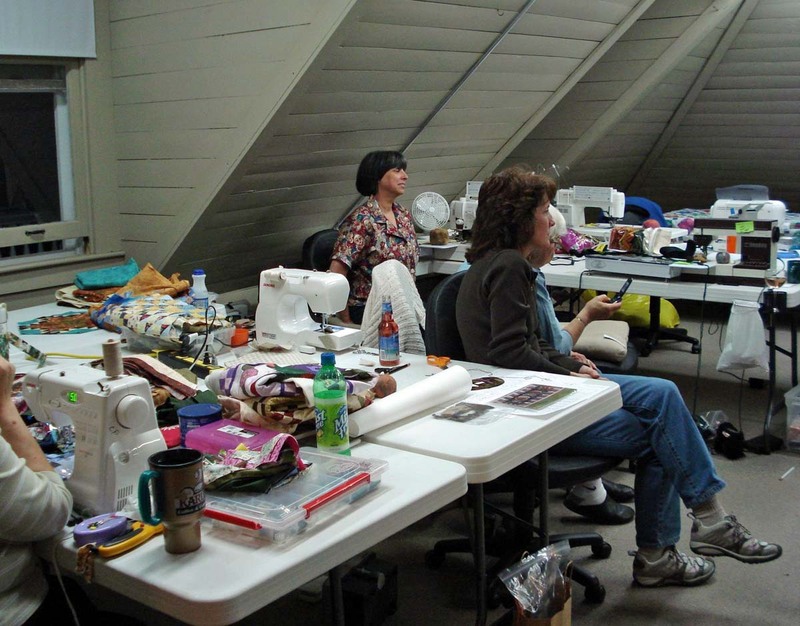 Isn’t it great to spend time with other quilters? 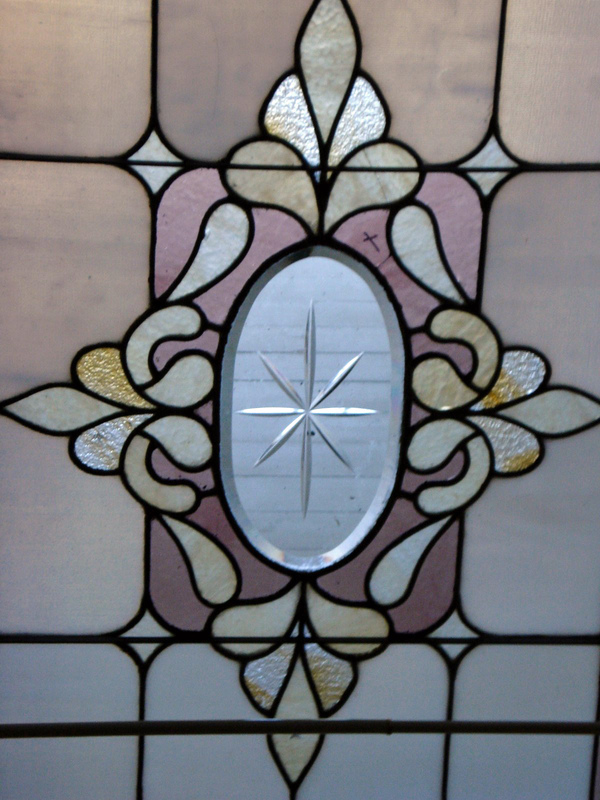 Each time I go I get what I like to call “Pearls of Wisdom from the Mansion”. 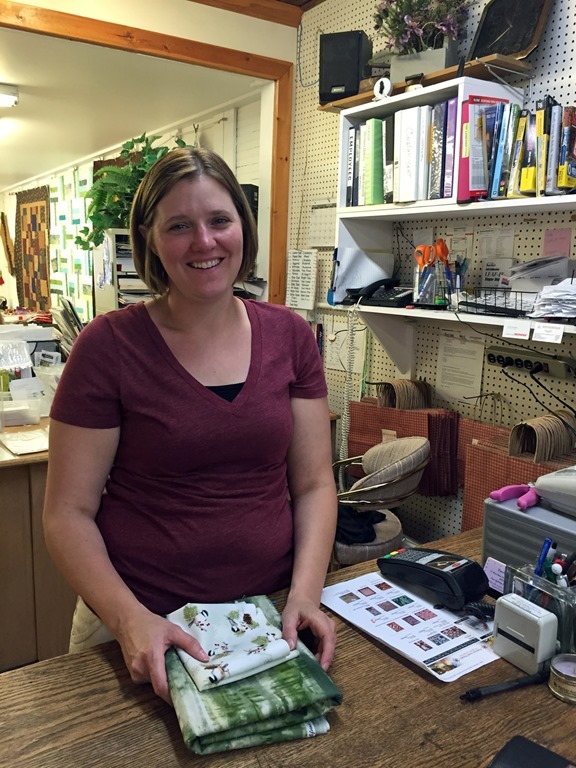 This time I learned about a new quilt store to check out in eastern Wisconsin that just opened, and learned how to create an apron from a recycled men’s shirt (Lori showed us how). So cute.